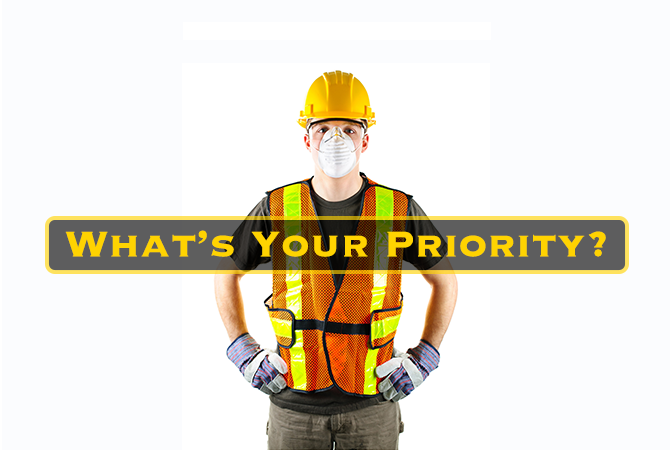 Is Construction Safety Really Your Top Priority? The construction industry is made up of opportunities for growth—we create the future with every new structure that goes up. Our workers are talented men and women who can visualize a completed job with just blueprints, and who have the skills to build incredible developments from the ground up with their own hands. Errors occur in every workplace. In a restaurant, the kitchen manager may have to take an item off the menu if the correct supplies weren’t ordered. In an office, production may halt for a few hours if the printer breaks down. Yet in our industry, an error as small as climbing an unsecured ladder could lead to a fatality. While mistakes in other industries may just lead to the loss of a big account or a few hours of lost productivity, in construction, mistakes can cost lives. To prevent such tragedies, we develop safety processes and codes … and inevitably, excuses are made and processes aren’t followed. It’s a mentality that’s just about as old as time, but with the right introduction and on-boarding processes, you can influence your workers to follow procedures, look out for one another, and keep your team safe and healthy. In the case mentioned above concerning the falling ladder, the worker should have followed OSHA regulations, which require ladders to extend a minimum of three feet above the landing surface, and be used only on stable and level surfaces unless secured to prevent movement. Following these simple procedures would have saved that worker’s life. We know that following safety practices saves on costs—between worker’s compensation, medical fees, time off and insurance premiums, the U.S. Department of Labor estimates that “a good safety and health program can save $4 to $6 for every $1 invested.” But keeping your workers safe and healthy is about so much more than the company’s bottom line. A safety-conscious job site produces more efficient workers, less errors on the job and an overall better workplace culture. Alternatively, unsafe work environments will lead your team to think that you don’t value their health and well-being. They’ll work slower and less efficiently. And naturally, more accidents will occur. Perhaps even deaths. According to OSHA, 4,585 workers were killed on the job in 2013. To put that number in perspective, it breaks down to 88 workers per week, or 12 individual deaths every single day. One incident from that year happened on a Midtown New York hotel construction site by Rinaldi Group. A worker fell three stories while the current building was being demolished, and OSHA cited the firm for unsafe work conditions due to a lack of guard railings around floor openings. Fast forward two years to May 2015. The same company, while working on the same job site, lost 25 year old Christian Gisci after he fell 24 stories down an elevator shaft. As it stands, about 12 families lose their loved ones every single day. This loss is often intensified by the loss of a much-needed income, causing families to deal with the loss of their loved one and reduced financial security at the same time. What’s staggering is that in nearly all cases, these deaths and accidents could have been prevented simply by following the safety procedures that are already commanded and enforced by OSHA. Whatever may be holding you or your team back from fully following safety requirements—it’s time to rethink it. The facts are clear and there’s no decision to be made: Safety NEEDS to be a priority on every job site.